The best route to tasteful gift giving follows this Rocky Road Gourmet Apple. It’s a tart Granny Smith apple dipped in caramel and milk chocolate, then rolled in a mouth-watering mix of pecans and marshmallows and drizzled with white confection. This apple is decadent and totally delicious. Measures 8”H x 4”W x 4”L Arrives as pictured tied with a bow. This gift is exceptionally fresh and requires overnight delivery. 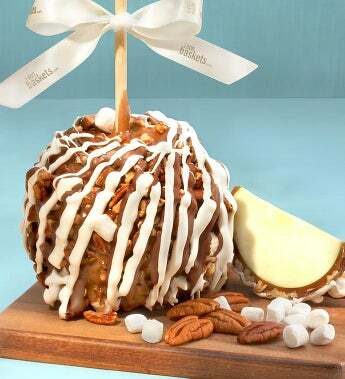 The best route to tasteful gift giving follows this Rocky Road Gourmet Apple. It’s a tart Granny Smith apple dipped in caramel and milk chocolate, then rolled in a mouth-watering mix of pecans and marshmallows and drizzled with white confection.